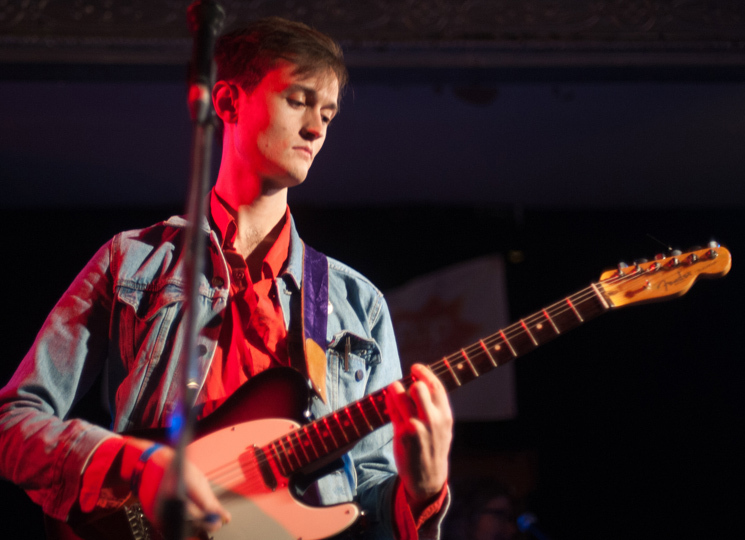 Tim Darcy, the charismatic lead singer and lyricist of the great Montreal band Ought, played a rare show with his solo band, debuting songs from a record made with this configuration that he told us would be released in the new year. Though Ought have been labelled "post-punk," they're purposefully open-ended. And yet, Darcy took that free aesthetic to a whole other level here, transforming his band as each song went. When they started, the sound was like some country-folk-infused ramble rock. Darcy's band featured guitarist Tristan Petsola, bassist Dorothea Paas, and Charlotte Cornfield on drums, and they all got lost in a pretty scrappy, invigorating thing. It was all more proto- than post-punk, like Dylan trying to make the roar in his head in 1965 land on tape and actually creating a new sound. "Next time, leave me a halo," Darcy sang — a spare, vivid line that shows off the kind of thought he puts into such things. At one point relatively early on, Petsola unplugged his guitar and left the stage after playing all the songs he'd learned. Darcy instantly formed some complex chords, letting octaves ring. The band suddenly time-travelled, via this stirring instrumental, that recalled similar wordless anomalies by Silver Jews. From there, Darcy performed a song in solitude, making the earlier playful lark with his full band seem like ancient history. But when Paas and Cornfield and Darcy's barre chords returned, the short purposeful song they played once again redefined the outfit's sound and sonic possibilities. And then, to close it all down, Cornfield took to an upright piano and Darcy placed his guitar on the ground and sang a beautifully poetic song full of dandelion streetlights and begrudging understanding. It was all simply gorgeous and inspiring and another indication of the power Tim Darcy possesses as one of music's finest young artistic minds.